Iowa travels to Madison to face the Big Ten’s last undefeated team this Saturday with kickoff set for 2:30 PM. The Hawkeyes (6-3, 3-3) are trying to reclaim the Heartland Trophy from the Wisconsin Badgers (9-0, 6-0). Iowa is coming off its stunning and spectacular 55-24 upset win last Saturday over Ohio State while Wisconsin downed Indiana on the road 45-17. In addition to the Buckeyes, the Hawkeyes have defeated Wyoming, Iowa State, North Texas, Illinois, Minnesota – while losing to Penn State, Michigan State, and Northwestern. Iowa’s three losses have come by one possession each and two of those came down to the last play of the game. The Hawkeyes win over Ohio State was the 400th home win in the history of the football program. Wisconsin’s wins have come against Utah State, Florida Atlantic, BYU, Northwestern, Nebraska, Purdue, Maryland, and Illinois – as well as the Hoosiers. Iowa is 20th in the College Football Playoffs rankings while the unbeaten Badgers are eighth. The Hawkeyes are 25th in the A.P. Poll – Wisconsin is sixth. Iowa is not ranked in the Coaches Poll, but the Badgers are third. This series is about as close as it can get. Wisconsin leads the series 45-43-2 after defeating Iowa last season at Kinnick Stadium 17-9. The visiting teams have won the last six meetings. Iowa is 19-26-1 all time in games played in Madison, including the last one 10-6 in 2015. Kirk Ferentz is in his 19th season as Iowa Head Coach with a record of 141-95 at Iowa – and he’s now just two wins shy of tying Hayden Fry as Iowa’s all-time winningest head football coach. Both Ferentz and Fry rank in the top seven in the Big Ten both in terms of overall wins and conference victories. Ferentz is also currently the dean of college football coaches. Paul Chyst is in his third year at Wisconsin with a record of 30-6. Overall, he has been a head coach six years with a record of 49-25. Iowa is looking to win its 10th trophy game out of the last 11 it’s played – the only loss in that streak coming at the hands of the Badgers last year at Kinnick Stadium. Wisconsin, however, has won 15 of its last 16 trophy games against Big Ten West rivals Iowa, Minnesota, and Nebraska. The Badgers have played in the B1G Championship Game four of six years – and if it defeats Iowa this Saturday it will lock down the West Division berth again this season. 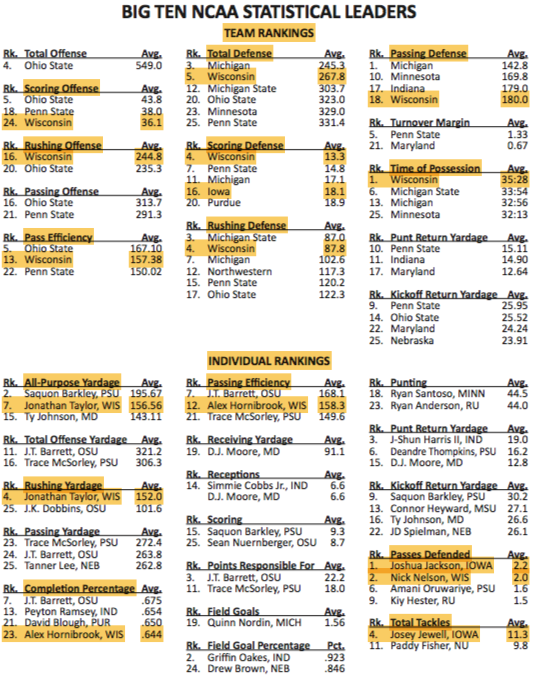 Iowa is B1G-4, FBS-16 in Scoring Defense and has held eight of its nine opponents below their scoring average (Iowa State in overtime is the lone exception). The Iowa – Wisconsin Game will be televised by ABC with announcers Joe Tessitore, Todd Blackledge, and Holly Rowe. It will be broadcast on the Hawkeye Radio Network with announcers Gary Dolphin, Ed Podolack, and Rob Brooks – and it will also be available on satellite radio XM Channel 195 and Sirius Channel 135. The Heartland Trophy isn’t the only trophy at stake this weekend. In a long-standing tradition, the Iowa and Wisconsin team managers will battle it out Friday evening for the “Rusty Toolbox”. Iowa’s Depth Chart is unchanged from what it was for Ohio State. And why would you make any changes after that performance? Wisconsin has been plagued by a series of serious injuries to key players. The latest are to starting Linebacker Chris Orr, starting and leading Wide Receiver Quintez Cephus. They join staring WR Jazz Peavy, among others, listed as “out” for Iowa. In addition, starting Safety D’Cota Dixon is questionable. Was Iowa’s play against highly ranked Ohio State the result of team growth and gelling at the right time in the season – or a bit of a fluke? 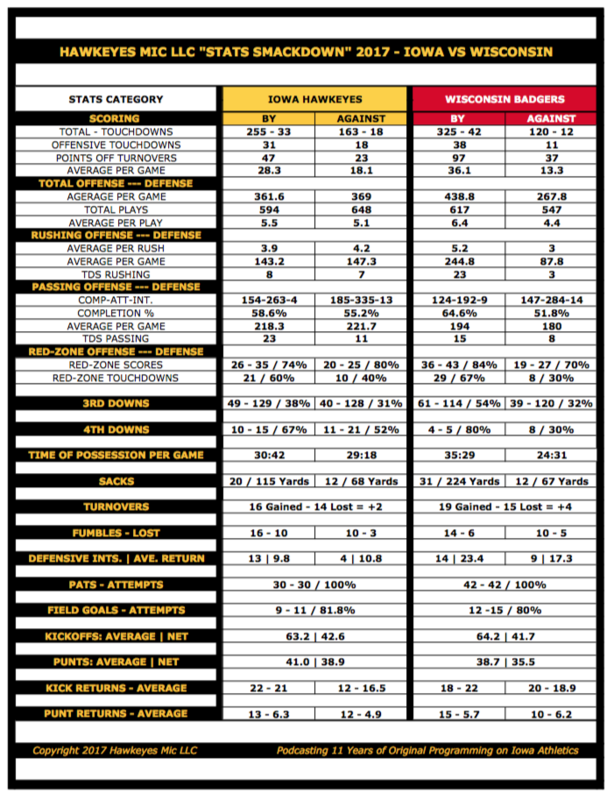 There is no doubt that Wisconsin is a very good team – but how good, really – as Iowa will be the first ranked team the Badgers have played against? Can Iowa’s young Offensive Line protect Quarterback Nate Stanley against the unique and very aggressive defensive schemes run by Wisconsin’s Defense? Iowa’s 2017 opponents have a combined record of 68-40. TeamRankings.com lists the Hawkeyes at No. 8 in strength of schedule, third among Big Ten teams (No. 1 Penn State, No. 3 Ohio State). The Hawkeyes first nine opponents have a combined record of 51-30. Their final three opponents have a combined record of 17-10. QB Nate Stanley has 22 touchdown passes, second in the Big Ten and tied for 11th in the nation. Stanley has thrown 12 touchdowns and zero interceptions against this week’s AP top 25 (No. 11 Ohio State, No. 13 Michigan State, No. 16 Penn State, No. 24 Iowa State). He averaged 236.8 passing yards per game against those four opponents. LB Josey Jewell leads the Big Ten and ranks fourth in the nation with 11.3 tackles per game. He has 92 tackles this season, tops in the Big Ten and tied for ninth nationally. Jewell has 393 career tackles, seventh all-time in program history. Junior DB Josh Jackson leads the country in passes defended (20) and is tied for second in interceptions (5) and passes broken up (15). He leads the Big Ten in interceptions (5) and passes defended (20). Jackson tied a school record with three interceptions against No. 3 Ohio State on Nov. 4. He is a Bednarik Award semifinalist and was named the Big Ten and Walter Camp national defensive Player of the Week after his three interceptions in the win over Ohio State. Sophomore DE Anthony Nelson is tied for third in the Big Ten with six sacks (27 yards). Nelson had six sacks as a freshman last season, second best on the team. True freshman A.J. Epenesa is tied for second on the team with 2.5 sacks, and leads the team with seven quarterback hurries. Second-year tight ends Noah Fants (So.) and T.J. Hockenson (redshirt freshman) have combined for 42 receptions this season. Among those 42 receptions, all but five have resulted in a touchdown (10) or first down (27). Fant’s seven touchdowns are a single-season school record for a tight end. Michigan State and Ohio State are now tied for first in the East Division with 5-1 records – and the Spartans are the only team left in the East that controls its own path to the Big Ten Championship Game. Wisconsin continues to lead the West Division with a 6-0 record and is one of just five FBS teams remaining with an undefeated record. This is the best start for the Badgers since 2004 and they have now won a school record 12 straight Big Ten games. Iowa – Wisconsin Game Week Content is here.